Discover how easy it is to throw a ‘stress free’ party and create wonderful memories that’ll last a lifetime. Don’t risk disappointing you or your child. Sit back, relax, take a break… while the children (and adults) are enjoying Brisbane’s Best Birthday Party Magic Show… ever! I offer a couple of different entertainment packages. How much? Please submit the form below for immediate access to the entertainment package details. 0.15hr By this time all kids have arrived. Magic Glen arrives to set up and the kids are welcome to watch and chat to Magic Glen during this time. 0.30hr Magic show starts. You now have 45-55 minutes to relax. 1.15hr Magic show finishes. 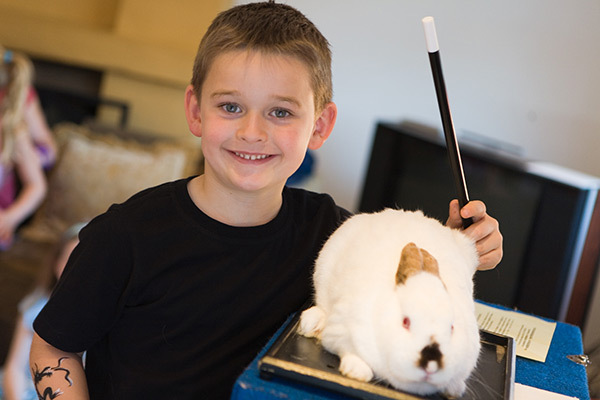 Kids get to pat the Rabbit. Free gift is explained and handed out to all the kids. If required, balloon animals are handed out. Party bag contents are explained. 1.20hr Magic Glen says goodbye. Kids are led away to cut the birthday cake, sing happy birthday and have snack and a drink. 1.45 Kids have finished eating and have about 10 minutes of free time to play in the garden. 1.55 Parents start arriving to collect their child. Goodbyes. 2.00 The party is over. Your home is quiet. You have had a stress free party. The kids have been entertained and your child is feeling rather special. Note: A typical birthday party duration is 2 hours. How many kids should you invite to the birthday party? Very funny and entertaining with magic and jokes. 100% keeps the kids engaged. Thanks for the great party for Milly, all the kids loved the show! Best birthday party ever. Such a great entertainer my son will have memories of this party forever. Awesome!! Kids (ages 10-11) loved it and were engaged the whole time. Thoroughly recommended. Great show at booval shopping center. Kids loved it- so did the adults. Great work Magic Glen. Amazing,funny and entertaining! Will have Glen and Rocky back any day! Excellent for children's parties, keeps the children enthralled. Would recommend in a heartbeat. Thanks Magic Glen ....was sooooo good !!!! Kids loved it !!! You’ll Get Great Results Like This Too!!! Magic Glen is conscious that not all kids are the same, some are more outgoing and some are quiet and reserved. 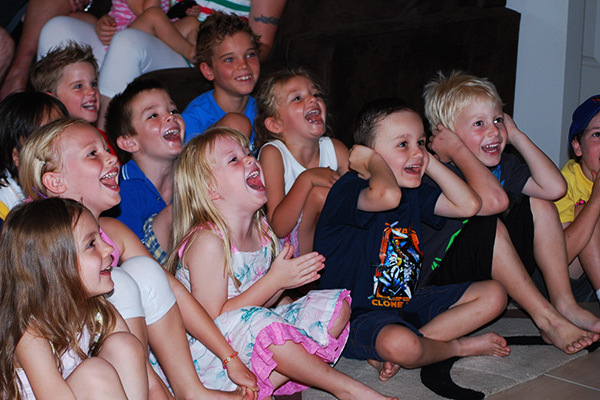 The birthday party magic show style is adjusted to suit the temperament of the birthday child and their friends. 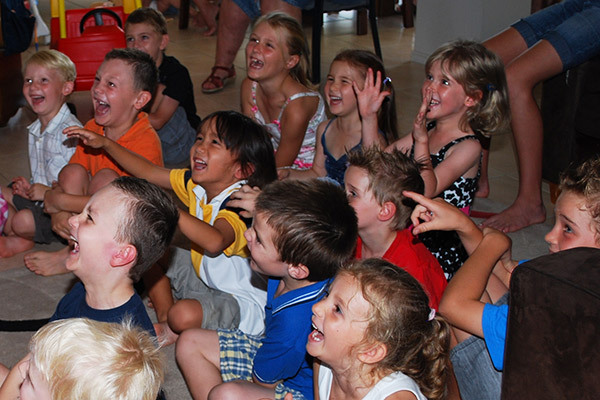 You can rest assured that your child will be treated with the upmost consideration and that the hilarious magic show is suitable for all kids, boys and girls. Magic Glen – experienced, reliable, polite, professional and above all else…Funny! Cute Bunny Rabbit – All the kids get to pat the Rabbit, get your camera ready! Happy Birthday Child – your child and their friends will have been laughing and laughing, it will be the talk of the classroom. Magic Glen’ is a full-time Brisbane based birthday party kids magician servicing Brisbane, Sunshine Coast and the Gold Coast. Amazing as it may seem, ‘Magic Glen’ has performed at over 3000 birthday parties in Brisbane and given out over 15000 party bags… Wow that’s a lot of party bags. As a kids magician in the birthday party market his goal is to give parents a ‘Stress Free’ birthday party that will be enjoyed by the children AND… the adults. After 15 years as a professional kids magician, Magic Glen is still the busiest children’s birthday party kids magician in Brisbane… Why? 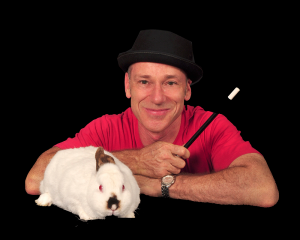 It’s simple…he has a great birthday party magic show that kids (and adults) just love. You don’t see ‘Magic Glen’ advertising in Brisbane parenting magazines or on Google…he doesn’t need to… most of his birthday party bookings come from repeat business and referrals…once you experience Brisbane’s funniest birthday party kids magician…you will be recommending him as well! ‘Magic Glen’ is a parent and knows exactly what makes kids laugh… He is a natural kids entertainer as well as kids magician with a big smile, a funny face and cheeky personality… the perfect combination for a birthday party kids magician. 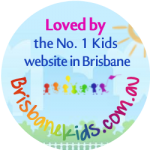 In 2008 ‘Magic Glen’ was voted Brisbane’s birthday party kids magician. The real test for ‘The Best’ birthday party kids magician in Brisbane is to read the glowing testimonials from happy parents just like you… and take a look at the childrens faces on this site…beaming with delight and happiness… and enjoying one of the most memorable days of their lives… that’s his promise to you. Magic Glen – The funniest birthday party kids magician in Brisbane?… Book his birthday party magic show…and you will know why!